Statistics suggest the majority of physicians are making the switch to smartphones, but are hospitals ready to accommodate their needs? While physicians may be lagging behind the EMR adoption growth curve, getting this same group on board with other forms of technology has not been nearly as complicated or wearisome. A recent study by Spyglass Consulting Group reveals significant trends concerning how physicians across the United States are adopting mobile communications. The report notes that 94% of physicians are using smartphones to communicate, manage personal and business workflows, and access medical information. Compared with a November 2006 study by the same group, this number reflects a 60% increase in adoption rates. “Physician smartphone adoption is occurring more rapidly than with members of the general public,” says Gregg Malkary, managing director of Spyglass Consulting Group, adding that there is also a clear preference for the Apple iPhone (44%) over the RIM BlackBerry (25%). How is it that a group that has been resistant to plunge into the HIT waters from a practice workflow perspective is now eager to snap up mobile devices? Industry professionals suggest the desire for technological savvy on the personal front is much different. While physician adoption of smartphones has been progressing, hospitals’ ability to accommodate their needs has not kept pace, preventing the devices’ use as true point-of-care instruments. Rick Gentry, director of healthcare solutions at Ruckus Wireless, notes that many physicians are looking to the smartphone as a way to converge communications (eg, voice, video, data) to a single device, but reliably using the devices inside hospital walls remains an issue. Consider the recent FDA-approved application for the iPhone called AirStrip OB. Hospital physicians can now monitor patients in the labor and delivery wards in real time, gaining remote access to fetal heart rate tracings, vital signs, and the latest nursing notes right from their smartphone. “That is a really hot application right now,” Gentry says. Industry experts say the potential exists for smartphones to create efficiencies in the delivery of patient care without decreasing quality. In fact, many agree that communications may become timelier and clearer as a result of smartphone use. The recent Spyglass Consulting study, which was derived from more than 100 interviews with physicians working in acute care and ambulatory environments nationwide, found that 78% of the interviewed physicians were experiencing difficulties accessing and communicating with colleagues in a timely manner. Sperling points out that once smartphones were introduced into the workflow at Long Beach Memorial, communications between physicians sped up considerably, resulting in more efficient and effective patient care. Smartphone availability also means improved accessibility to physicians, according to Malkary, who points out that doctors are busy and mobile by nature. However, physicians currently lack financial motivation to be more accessible because reimbursement tends to focus on the quantity of billable services, meaning tasks are prioritized by what can be reimbursed. Taking time to check and return phone calls and e-mail messages in an office is not necessarily a high priority for physicians. As a result, they can become overwhelmed by information from colleagues, care team members, and patients, Gentry says. However, with smartphones, physicians can focus on patient care and tasks that are billable while still managing some correspondence on the fly. Gentry says the convergence of these modes of communication to the smartphone provides a single point of access for clinical data and communications. Regarding patient care, physicians find that a smartphone not only speeds up communication with other clinicians, according to Sperling, but also provides quick access to reference information such as medication details and dosing. This way doctors are able to access needed information faster, making patient care timelier and more accurate. Infrastructure requirements tend to be the greatest hurdle for many hospitals looking to add smartphones to their workflow. In an age of mounting IT needs and cash-strapped facilities, finding the resources to adequately address coverage and reliability is no small task, notes Gentry. “I would say that the majority of Wi-Fi deployments in hospitals across the U.S. market will probably be inadequate for many of the new and emerging wireless applications in their current state,” he says, noting that attempting to add new wireless solutions to old infrastructure will not produce the results a hospital wants to achieve. Sperling says as technology has advanced on the wireless device front, hospitals have not made keeping up with the latest developments a priority. “Corporations and hospitals obviously don’t want to replace something that’s working [for present needs],” he says. Malkary says many organizations are installing distributed antennae systems to ensure uniform coverage. These networks of spatially separated antenna nodes connect to a common source and provide wireless service within a structure, making it possible for hospitals to extend reliable wireless coverage to all areas. As video and image files get larger, bandwidth will become a primary concern, according to experts. “Bandwidth is critical, especially if video conferencing truly becomes mainstream,” says Malkary. He points out that as hospitals start dealing with more rich applications, the need for adequate bandwidth will continue to heighten. Along with infrastructure needs, Gentry cites two other areas that will play an important role in a hospital’s overall smartphone strategy: the devices used and the applications deployed on those devices. Industry observers have noticed huge variances in device performance over the same infrastructure. Offering the recent debacle over the new iPhone design (critics cited poor antenna placement) as an example, Gentry points out that variances in equipment design can create issues for other devices as well. Sperling supports the idea of a facility conducting a pilot study before adding smartphone technology to any workflow. At Long Beach Memorial, extensive training and a well-designed pilot program were implemented to ensure a smooth transition. It will require a change in behavior, Gentry adds, pointing out that you are “asking clinicians to do things differently than they did in the past. With what seems like so many advantages with smartphone deployment, it would appear that hospitals would be primed to move initiatives forward. That’s not necessarily the case, according to several industry insiders who point to monetary priorities and concerns over security associated with wireless workflow. 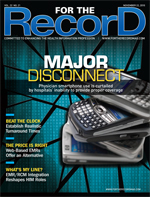 According to Sperling, the greatest challenge to moving initiatives forward at Long Beach Memorial rested with buy-in from C-level executives and corporate headquarters who had to be convinced it was OK for physicians to receive EMR data over wireless devices and still be HIPAA compliant. “You can’t just have anybody logging in and accessing patient records,” Sperling says, pointing out that it came down to balancing access with meeting HIPAA requirements. Security safeguards become a major issue on a number of fronts, Malkary says, including how to handle multiple deployments to support numerous types of devices. For example, if a hospital IT department focuses solely on BlackBerrys, then the majority of physicians using iPhones are going to find other ways to get the information they need. In this case, according to Malkary, physicians are forwarding their corporate e-mail to a Gmail (Google Mail) account, which is a HIPAA violation. “That could put the hospital at risk for a lawsuit,” he says. Reliability concerns remain a hindrance to executive buy-in, especially if physicians and other clinicians are turning to their smartphones to receive patient alerts. “What if the system doesn’t work? Or what if I get fatigued to alerts?” notes Malkary, who says these types of issues are hurdles to overcome to meet concerns from FDA regulators. Playing devil’s advocate to the assertion that information will be more readily available via a single device, Malkary suggests that a physician could miss a critical alert if a multitude of communication is coming over the same device. “Today there is no real way to know if [someone] got the communication,” he says. Another issue centers on where smartphone deployment rates on hospitals’ to-do lists. In the age of meaningful use, most healthcare organizations are pushing most of their resources toward meeting the federal guidelines. Will implementing mobile devices help hospitals achieve meaningful use goals? Can smartphones provide physicians with the necessary data to fulfill requirements? Ease of use is another roadblock preventing facilities from jumping on the smartphone bandwagon. Screen size and other readability issues make the devices sketchy tools for some physician functions. Malkary references a study whose results show that physicians are using smartphones primarily as a reference tool and not necessarily for functions that would help with the meaningful use equation. Specifically, the study found that 4% of physicians use smartphones to look up lab results, 2% for electronic charge capture, 1% to ascertain electrocardiogram results, 1% for e-prescribing, and 86% for reference applications. While some of these numbers are dictated by the types of information a particular hospital is willing to provide on a wireless network, many physicians note they still prefer to do certain functions, namely e-prescribing, on a desktop terminal.